Posted by admin in Hawaii, Kilauea, NASA Earth Observatory, United States. The NASA Earth Observatory has a great crystal-clear image of the plume that is emerging from the vent in Kilauea’s Halema’uma’u Crater, captured by the Advanced Land Imager (ALI) on NASA’s Earth Observing-1 satellite on 19 August 2009. For more on this, see Dr Erik Klemetti’s informative post at Eruptions. Posted by admin in activity reports, eruptions, Hawaii, Kilauea, United States. Since early December the Halema’uma’u gas plume has changed from opaque to wispy and translucent. On 31 December 2008 infrared imaging revealed that a previously open conduit in Halema’uma’u vent had become blocked by rubble, and that vent temperatures are greatly diminished. Sulphur dioxide emissions, while still elevated compared to 2003-7 levels, have fallen to their lowest values since late 2007. The composition of tephra ejected from the vent has changed: in early December more than half of the tephra was derived from molten lava, two weeks later the volume of tephra had decreased and it mostly consisted of fragments of pre-eruption rocks from the vent walls. ‘If an eruption is defined as a volcanic event that deposits solid material on the ground surface’, says Jim Kauahikaua, ‘then the Halema’uma’u eruption stopped in mid-December’. Nevertheless, he warns that the summit vent remains in ‘a state of unrest’. Seismic tremor also remains elevated. This falling-off in activity may be a pause rather than the end of the eruption: only time will tell. Posted by admin in Hawaii, Kilauea, natural hazards, United States. The Hawaii House of Representatives Special Committee on Vog Effects, appointed in May, has just published its report, which lists 48 recommendations for coping with Kilauea’s volcanic smog and its unpleasant and unhealthy effects. The report is mercifully brief for a governmental document at 20 pages, and can be accessed in neatly typewritten form from the Hawaii Capitol website (click here for a direct link to PDF). A single point of contact for members of the public who need information and advice about vog. The development of ‘a more coordinated and efficient system for collecting health data’: at the moment health data are collected by a range of organizations and individuals, making it difficult to assess the whole picture when it comes to vog-related health issues. The examination of ‘the psychological impact of vog on school children’ and the development of ‘counseling strategies’. Previous generations had to cope with the problems and crises they encountered without the benefit of counseling strategies: heaven knows how they managed. Fitting hospitals with air filtration devices and sealed environments to protect patients from the effects of vog. Initiatives to monitor and protect the safety of public water supplies, and to ensure the public is well-informed about vog and water safety issues. The provision of air conditioning and air filtration devices to schools (which is great, assuming the gear can be plugged in). The offering of tax relief to farmers who have suffered from the effects of vog. Improvement of monitoring and early warning systems across Hawaii. The eruption at Halema’uma’u vent shows no sign of declining, and continues to pump out huge quantities of sulphur dioxide. Hawaii’s vog problem is not going to go away. For more on vog: Hawaiian Volcano Observatory: sulfur dioxide, vog and volcanic ash FAQ. For all our Kilauea coverage: Kilauea « The Volcanism Blog. Over recent weeks it has been business as usual at Kilauea, summarized by the Hawaii Volcano Observatory (with variations) as ‘Sulfur dioxide emission rates from both the Halema’uma’u and Pu’u ‘O’o vents remain high; tephra production continues from the Halema’uma’u vent. Lava flows through tubes to the ocean west of Kalapana’. Seismic activity continued to be focused on Halema’uma’u Crater; tremor levels are at moderate values. Seven hybrid seismic events were recorded; The two largest, at 3:54 pm yesterday and 7:28 am this morning, resulted in dusty brown ashy plumes being ejected vertically with a few red flashes visible even in daylight; NPS eruption crew observers at the Jaggar overlook reported no sound associated with yesterday’s event. A total of 20 earthquakes were located beneath Kilauea or nearby, including 12 beneath the south caldera and 2 on south flank faults, with the number of RB2S2BL earthquakes up slightly to values of 60/day). The 07:28 am 10/12 explosive eruption warranted a special weekend tephra collection mission yesterday. The eruption did produce significant tephra deposits, some of the pieces were fist- to grapefruit-sized frothy lava. Most of the samples were glassy lava bits with minor rock fragments and dust. Despite the fact that the 10/12 07:28 hybrid seismic event was larger than the 9/2 hybrid seismic event, the 10/12 deposit was significantly smaller. The Hawaiian Volcano Observatory caught the 12 October event on video, and you can see the resulting two excellent films via the images page on the HVO website (where many more wonderful images and videos are available). For more on this, see the coverage at the Eruptions blog: ‘Ash eruption video from Halemaumau’. Kilauea volcano continues to pump out high levels of sulphur dioxide in its emissions, which contributes to high levels of volcanic air pollution. When the wind is in the wrong direction, large parts of Hawaii Island are choked in the nasty, acidic haze, which can cause significant health problems. Back in May the Speaker of the Hawaii House of Representatives appointed a Special Committee to investigate vog effects. The Committee held its final meeting last week, which was addressed by health, education, civil defence and emergency services representatives. The consensus seems to be that there is very little one can do to get away from vog, but that one can shelter from it. Health officials suggest that residents should create ‘safe rooms’ in their homes where they can shelter from the effects of vog, and the Department of Education has announced that ‘safe rooms’ with purified air supplies will be set up in all Big Island schools. Some sectors of agriculture have been hit hard by the persistent vog produced by the volcano’s activity since the spring, and among other plans floated has been the suggestion that farmers could be evacuated to areas unaffected by vog. In general, the Committee itself seems to be looking to Washington for assistance in dealing with the vog problem: ‘We really need to reach out to FEMA and Congress for some help on this issue’, says Committee Chair Robert Herkes. Posted by admin in activity reports, Hawaii, Kilauea, United States, volcano culture. 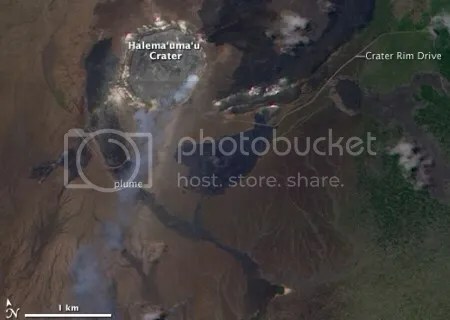 Catching up with a story from last week, the USGS Hawaii Volcano Observatory announced on 5 September that a ‘sloshing’ lava lake had been observed within Halemaumau vent at Kilauea. Erik Klemetti has all the relevant information and links over at Eruptions; as he says, lava lakes are fairly rare and transitory phenomena, so this is an exciting and interesting development. … a molten lava lake is almost continuously active … The size of the inner crater and of the lake within varies with the phases of activity, but in 1915 the crater has been about 1,200 feet in diameter, and the lake within, at a depth of 365 feet or more, from 400 to 500 feet long, and 100 to 180 feet wide … The lava lake has a temperature of 1000° C. (1832° F.), and consequently a thin skin of frozen lava is maintained over the yellow-red liquid. The skin is broken by fountains which break to a height of from 10 to 40 feet; and by the currents which constantly provide a streaming of the lava and of the crusts; and by splashing caves at the margins of the lake. Floats, will the glory of Kapiolani be mingled with either on Hawa-i-ee. September 2008 sees the lava-light once more glaring from the lava-lake after an absence of more than eighty years. It will be interesting to see for how long it dazes the starlight this time. Ernest William Christmas (1863-1918), ‘Kilauea Crater’ (c.1916) [public domain image: source]. Above: Waikupanaha ocean entry, 28 August 2008. Lava flowing into the ocean at Waikupanaha creates a billowing plume (USGS/HVO image. detail). The latest Kilauea update from the Hawaii Volcano Observatory reports some explosive activity over the last 24 hours. A hybrid/explosion earthquake produced ‘a dense, brown plume’ from the Halemaumau vent at 14:46 local time yesterday, while two further spectacular explosions took place overnight, at 20:13 and 22:00 local time and were captured by webcam. Seismicity has been moderate, and levels of sulphur dioxide remain elevated. It looks as if the most recent inflation event has peaked, with the summit GPS network recording weak contraction across the caldera. At the Waikupanaha ocean entry things have been quieter over the past day or so, with no explosions, although at the end of August there was some spectacular lava-seawater interaction (see picture above). The town of Volcano was given a shaking by four minor earthquakes that took place around Kilauea yesterday evening between 20:13 and 22:17, but there was no damage or personal injury. In other Kilauea news, balloons are being used to track and measure gases in the volcano’s eruption plume. The plume-chasing balloons measure temperature, composition and water content, providing valuable information on changes in gas content as the plume moves through the atmosphere. Initial findings suggest that sulphur dioxide in the plume converts to nasty choking sulphide aerosols about one hour after leaving the volcano’s vent. The research is being done by Adam Durant and Matt Watson of Michigan Tech, who are currently carrying out postgraduate work here in the United Kingdom at the University of Bristol. Posted by admin in eruptions, Hawaii, Kilauea, United States. This natural-colour image of Kilauea releasing an eruption plume was captured on 7 August 2008 by the Moderate Resolution Imaging Spectroradiometer (MODIS) on NASA’s Terra satellite and is available on the NASA Earth Observatory site in both low-resolution and high-resolution versions. The grey eruption plume from the volcano can be seen blowing away to the south-west. Kilauea is inflating. The Hawaiian Volcano Observatory’s tiltmeter network has been reporting variable levels of inflation at the summit of the volcano since 27 June. Yesterday, 30 June, the HVO reported that ‘Both Kilauea summit and Pu`u `O`o Cone are inflating. The inflation is accompanied by increased ash production, increased amplitude of seismic tremor bursts, and increased intensity of vent incandescence at the summit’. The fact that the inflation seems to be becoming steadier rather than episodic, and is accompanied by increased tremor and incandescence, suggests the ascent of fresh magma is under way (although at the beginning of this year the ascent of magma within Kilauea took place during a period when the volcano was deflating: Kilauea is full of surprises). Detailed information on volcanic deformation at Kilauea can be found here: Kilauea deformation. From this source comes the graph below, which shows the tiltmeter data for Pu’u O’o Cone (‘POC’) and for Uwekahuna (‘UWE’) on the north-western rim of Kilauea crater, for the period 24-30 June. The general situation at Kilauea is that the Halema’uma’u vent is continuing to produce elevated amounts of sulphur dioxide (the most recent measurements, on 26 June, found the rate to be approximately 900 tonnes per day, as against a normal background rate of 100-150 tonnes per day), and Pu’u O’o crater is also releasing sulphur dioxide. Lava continues to flow to the ocean through the volcanic feature with the name that sounds like a prison movie, the Thanksgiving Eve Breakout. The HVO has some good images of volcanic activity at and around Kilauea, including the following pictures of a fine littoral explosion at the Waikupanaha ocean entry, caused by the reaction between hot lava and cold seawater. Clicking on the images will take you to the source page, where these pictures were posted on 30 June 2008. For all our Kilauea coverage: Kilauea << The Volcanism Blog.